As if bloodied kin borne from the same torn womb, the Normans and Turks shook the foundation of Christendom and the Dar Al-Islam respectively. Theirs would be a legacy which would forever change the nature of warfare for their respective communities, instituting a superiority of equestrian warriors not to be eclipsed for many centuries. With their ancestors of Northmen Vikings and Turkish Nomads emerging roughly simultaneously, these two maelstroms of North-West and North-East swept across the world of Islam and Christendom to contest for the throne of martial supremacy of the known world in the Near East./n/nThe warrior's crown is not the only means by which the Normans hold sway, the scepter of kingship held in the hand not possessed by a blade's grip. Perhaps these Northmen's greatest accomplishment was the conquest of England under William of Normandy in 1066, serving too as a climatic avatar of the horseman's victory over the foot soldier. Not to be outdone, William's brethren went off as mercenaries to the cause of Christendom in Armenia and the realm of the Eastern Romans or the reconquista of Spain. Their next flash of brilliance would be with the Crusades, where Normans from Italy under Bohemond of Taranto established the Principalty of Antioch. 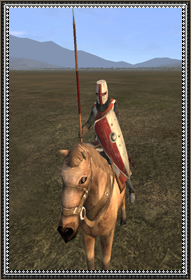 In Sicily, shadowed by the success of the Crusades and conquest of England, Roger II established the land as a Kingdom following its countship following the reconquest of the Island by Christendom in the late 11th century./n/nTheir ranks consisting of Normans drawn from the full breathe of battlefield experience across Christendom and her frontiers, these knights represent the very best of their warrior class outside perhaps only the Religious Orders. Their arnaments are at the cutting edge of Latin Christendom, consisting of tight-fitted mail hauberk and leggings, surcoat displaying proto-heraldry or the crosses of minor orders, and cumbersome if highly protective great helms. In their skilled hands are heater shields still holding a slight shape of the outdated kite design, well wrought iron swords and sturdy lances of which their fame has been borne from. It is with these spears which their task is realized, achieving the same vicious, unrelenting disciplined charge which brought the lands of Christ back into the fold of Christendom and shall see to it that the savior's feet touch down upon the soil of his disciples - not the sands of Muhammad.